A Carefree Record High Temperature in Arizona | Watts Up With That? I thought this was curious, especially since there were no other record high temps set in the state of Arizona in the last week. So, I decided to see what I could find out about the station. The photo above shows quite a bit of green for Arizona, I wasn’t sure if that was indicative of irrigation or a wet spring. Check out the albedo difference due to the airport tarmac asphalt. Warmer there on sunny days possibly? I checked the weather for that day, Thursday, July 8th, and found it was full sun all day. The red dot signifies the NCDC provided lat/lon. Note, that this was gathered (according to NCDC metadata) with a Lowrance GPS. However, the matchup isn’t always spot-on with mapping programs, plus that, since NWS has the most interest in rainfall data for hydrological forecast verifications, they take the GPS reading over the rain gauge, not the temperature sensor. I determined that the Carefree station temperature sensor was an MMTS electronic type (on a pole) and that it had two rain gauges. Interactive view available from Bing here. 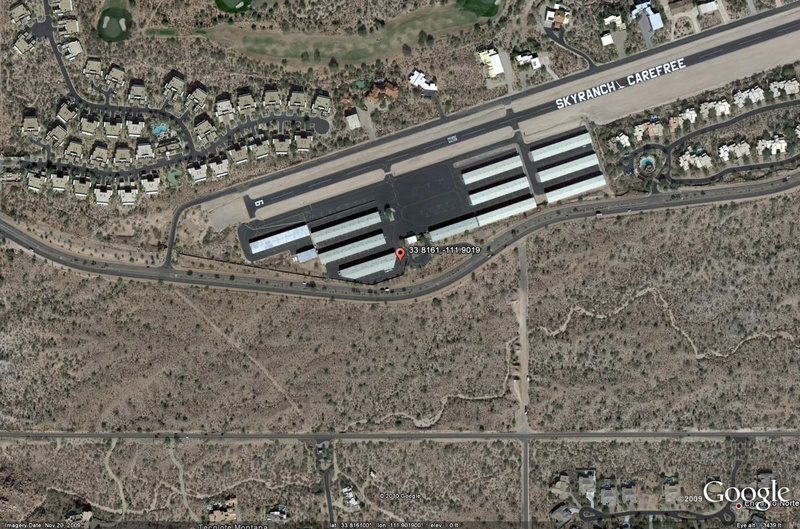 So what we have is a station near a building, in the middle of a sea of asphalt, in the summer in Arizona. I suppose I’m not surprised it was the lone high temperature record last week for Arizona. Perhaps somebody who lives in Carefree or knows somebody who does can get a photo of the MMTS temperature sensor from 4 compass points and an overall view. It would be interesting to see where exactly it is located. It is a municipal airport, and it looks like the NOAA equipment is in full view of the public parking lot. I’m betting it is near the rain gauges. Since one is a tipping bucket gauge, requiring a power cable (if it is a Fisher-Porter type with conical top) then the NWS could have killed two birds with one stone when laying cable fro the MMTS electronic sensor also. 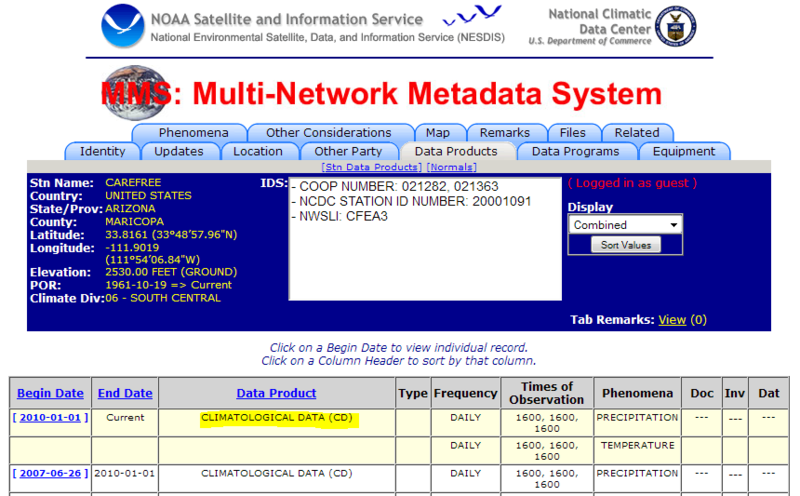 This station data is used to adjust other nearby stations that have missing data in NOAA’s FILNET process, and since it is published on the Climatological CD, may also get used in climate studies of temperature. I’ll check with my friend, former state California climatologist Jim Goodridge to see if he has the data on one of his CD’s from NOAA, and hopefully we’ll get some data from that station to help tell the story. Or, if anybody knows where to get it online, don’t hesitate to point it out. As indicated by the Weather Underground page, the station is a Davis Vantage Pro 2 PLUS model with the solar radiation sensor (notice the watts/m2 in the tabular data), a unit I’m very familiar with because I provide that model via my online business. I have no reason to doubt it being just as accurate if not more than the NOAA sensor. It has a similarly sized GILL radiation shield as the NOAA MMTS. It also has NIST traceable calibration for its sensors. And people try to argue that airport siting of weather stations, or that siting in general, makes no difference. You can homogenize rationalize just about anything. 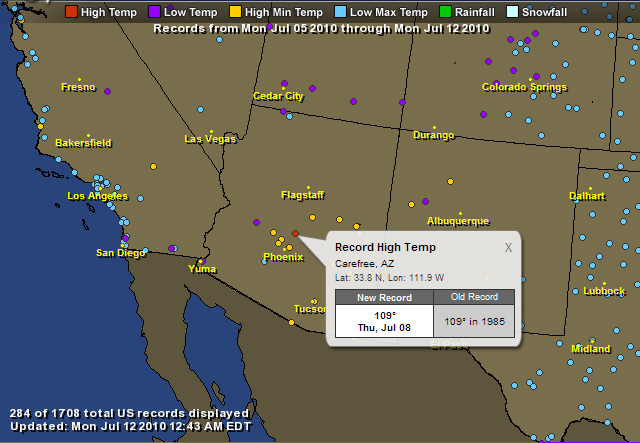 I suggest that the NOAA high temperature record for July 8th, 2010 in Carefree, AZ may very well be erroneous, and a byproduct of location. UPDATE: Commenter “Regg”, seems to think that the 129 feet elevation change between the two stations (that I didn’t think was large enough to be worth mentioning, since Google earth shows only a 10′ elevation change) could account for “most” of the 5°F difference. I considered this when I wrote the article. The high temp record in question shows 109–are the sensors useful only to whole degrees or is this rounded off? If the sensors are more sensitive, are they good to tenths, hundredths, or what? When an average temperature is calculated, is it (high+low)/2 or are there more readings involved. Thanks for your work–I steer as many people here as I can. REPLY: The MMTS electronic display has an autologging high/low memory, and displays in tenths. The observer rounds to the nearest whole degree F.
There is no “N” on the last image, but it would be interesting to note the wind direction (westerly) and see if it had the air from the tarmac upwind of the sensor. I ran the Fiesta Bowl Marathon in 1980. The race started in Carefree, which at the time was separated from Scottsdale by a good 10-15 miles. It is now part of the Phoenix Metro area – as the valley has seen massive growth. So Arizona really doesn’t have such extremely hot weather? This is very surprising. More questions, do the systems give a max/min value automatically, or is it up to the reader? I’m thinking that charting max/min times is also information about the weather, and by extension, climate. Connecting as they would to humidity, and air pressure changes. If you look in Google view, you will see the station out of the building area between the road and the area with buildings. (between e. craven road and the round parking). Dought this might not be the best place, it far from what you describe. It’s in a field, about 100 feet from the closest building. @erdos, 104 degrees F is hardly mid winter in Boston. Yes it does get hot. But the question is one of data corruption with a bias towards hotter readings. Sorry it’s east Cave Creek road (not craven road). It is extremely tempting to use airport weather data for climatology. There is normally a trained meteorological observer or high quality automated system, the recording systems are maintained, are linked to high quality communications systems and observations are carried out hourly. However, there is a major problem with the use of airport observations METARS or extracts and summaries from them for climatological purposes. For aircraft operations there are two main factors in making a safe takeoff and landing: wind velocity and outside air temperature over the runway. Engine power is based on the ratio between input air temperature and exhaust gas temperature. If the air is hot the engine(s) will produce less power. Therefore, if there is a ‘runway heat effect’ it is THAT temperature that is required to calculate the safe freight load and take off run distances. Whereas a climatological reading would (one would hope) want to make readings that were of the ambient air temperature unaffected by any heat island effects. In consequence, the use of airport temperatures should be avoided climatological purposes even if their use has administrative advantages. Unfortunately, airport temperature observations appear to be the majority of the reporting stations. The WU solar radiation graph shows a large downward spike about an hour after the high temperature. What is to be made of that? The temperature graph shows nothing simultaneous. I think the greenery is a golf course? Anthony, what excellent attention to detail are you like a scientist or something? What a great website! Excellent research which is well supported by evidence. There is a considerable urban/bias in the GIss records which has grown up over the years and which must now be influencing the entire database. How many Giss stations there are these days supplying info used in the regular official graphs? How many of them are the same ones as were suplying information in 1970? How many of them could now be reasonably classed as urban, but in 1970 were rural and are therefore now likely to be influenced by uhi?. I am beginning to think that wind direction and wind speed are going to be incredibly important to the resulting temperature readings. I would theorize that if the wind direction was parallel to the airport then temperature readings will be higher than if the wind direction was perpendicular. And, there must be a wind speed at which the air is able to reach maximum conduction from the asphalt and then delivers that additional radiated heat right to the temperature sensor. Are there any studies that have looked at airport temperature readings based upon wind direction and speed? For the purpose of aviation the thermometer is perfectly placed? For the purpose of climate OR local weather it is useless. Am I correct in my reasoning? Any plans to look at Dell City, TX as well? I noticed on the HAMWeather map center map you show, that Dell City, TX was a red dot (high temp) in a sea of light blue (low max temp). To me, that looks even odder then Carefree, AZ did. The new high temp also beat the old record from 1994 by a full 3 degrees. I took a quick look on Bing Maps and Dell City is an oasis of green irrigated fields. Again like Carefree it has an airport but I was unable to tell if the weather station was at the airport. The GPS location off the interactive map didn’t help. When I put Lat: 31.8 N, Lon: 105.3 W into Bing the dot was outside of town in the middle of nowhere. There was no road, two-track, building or even a tree that I could see in the area with the dot. If this is the location they may have an actual class A station! Another great job Anthony and is a good example of how things aren’t exactly as portrayed by the CAGW cabal. I can’t wait to she your full research report when it’s finished so that more of the truth behind the way global mean temperature is measured will be revealed. From the NOAA station data, the station is located at 33.83°N 111.91°W with an elevation of 2401 ft. While the private station you referred is listed to be at 2530 ft. according to what the owner entered in the Wunderground database. So that alone (the difference of elevation) can explain a good part of the delta between stations temps. REPLY: Uh, no it can’t. If you knew anything about meteorology you’d know about the dry adiabatic lapse rate. 9.8C per kilometer of elevation. Or in this case 17.64F/km which works out to 5 1/2°F per 1,000 feet. Since the elevation difference between stations is 129 feet according to the numbers you used, that would account for only 0.69°F out of a 5°F difference. area with lots of retirement amenities. For some unfathomable reason looking at it makes me think of Newton’s Third Law of Motion commonly known as for every action there is an equal and opposite reaction. I had puzzled over that red dot in the previous post, too. It’s clear to me that the global weather data is only loosely related to reality, but I’m still wondering why Carefree chose that particular occasion to have a record high; the sun often shines in Arizona, after all and they don’t only unroll the pavement for special occasions. With the general coolness all around, there should be a very idiosyncratic reason for this local exception; a truck idling e.g. My own experience with sensors of different types leads me to believe that they are all gremlin hang-outs, and I know that sounds silly but it’s better than saying they have a mind of their own. There might be a difference in the database with the exact location of the station, as part of NOAA is indicating 2401 ft, and other part is indicating 2530 – go figure. This morning if i look at both station’s data. The Carefree airport is reporting 77F while the personal station is indicating 80.3F . So what station is right ? From what i can see, the private station seems to be also affected by surrounding objects (home, trees, fences, lawn) – if you look at the webcam showing the back yard. REPLY: Yes, Regg, but this is FAIL#2 on your part. See above on your elevation fail. It is not surrounded by a sea of asphalt. I’m not saying it has perfect siting. But it is far better, and placed in a location that has somewhat more representative siting of the area. The backyard at least has untouched desert behind it. If the house siting was as big of a factor, the temps would be closer together. Also, the MMTS is read once a day, and the high/low recorded, where the private station reports every 5 minutes. You probably have the 77F as the low from the night before. There are some highly inappropriate readings being given out as valid comparisons to previous high records. As this post shows, temp can be several degrees or more higher at airports than locations close by. When the readings homogenised into the global data set things are to some extent sorted out when calculating the global average temperature. You couldn’t push a pin between the 1980-2010 trends for UAH and Hadley SST 2gl. HADcruV3 is about 0.02C/decade higher. GISS is the outlier (or outright liar?) with Hadley close behind. I think the fact that UAH and Hadley Met agree so closely on the 30 year trend is indicative that Hadley probably don’t deserve to be tarred with the same brush as the CRU crew. I live southeast of Phoenix and make regular UHI measuring trips from my densely urbanized neighborhood to the south where development abruptly ends. The trips are made just after sunset, always on the same route. In early spring delta t between urban and rural is approximately 5 degrees F. Now in summer delta t is up to 7 degrees F.
(2530-2401)ft = 129 ft delta elevation. I’m not so sure that would figure into the delta t we see between the airport site and the backyard site. My gut tells me asphalt at the airport is the culprit. 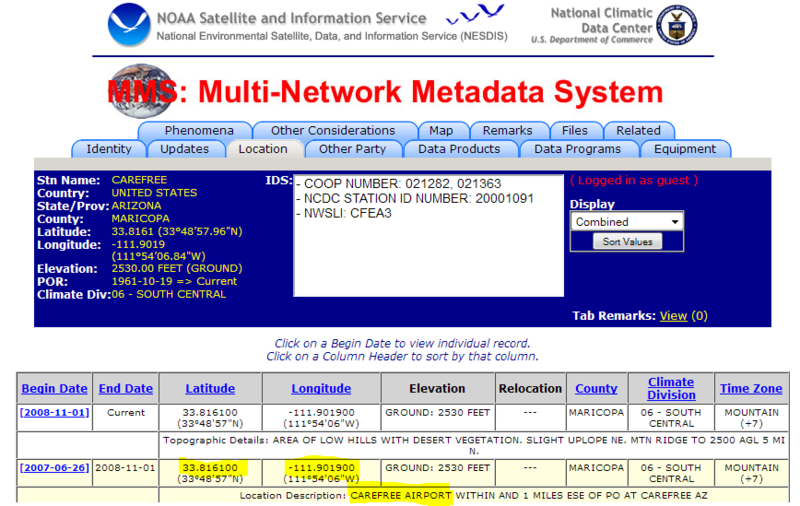 “From the NOAA station data, the station is located at 33.83°N 111.91°W with an elevation of 2401 ft. While the private station you referred is listed to be at 2530 ft. according to what the owner entered in the Wunderground database. increased altitude. At that rate, the difference in altitude accounts for about 1/2 degree of the difference in temperature, not 5 degrees. Regg, 130 feet explains 4 degrees F? Riigghht! Regg, tell me what you think. Does a difference of 100 feet have more effect on temperature in this environment, or does asphalt surrounding a data station have more effect? Please, I’m very curious. Regg, it’s only 100 ft.
I’m more surprised that it’s only a 5 degree difference. I would have thought a whole lot more. I think some might consider a lapse rate of 5 deg F per 130ft a little excessive? could be the sensor placed near the East Cave Creek Road istead, as shown by this Google Map link below? In Google Earth, look at N33.48.57 W111.54.06 rather than the decimal coordinates. Use the mouse pointer to locate the little white square next to the road at those coords. Then look at the 360º photo next to it, when you pan round you can see the screen (or what appears to be one next to the road. 100 ft elevation would not affect temperature more than 0.4F in the afternoon under dry adiabatic lapse rate. I wonder if the NOAA will adjust nearby temps higher in accordance with this high temp station data? A good scientist (or researcher in any field for that matter) is essentially a good detective, always searching for solid and irrefutable evidence. Fantastic detective work, Anthony! I really admire your persistence. Your work is actually reminiscent of that of Charles Darwin, who convinced skeptics of his own period about the truth of evolution through the sheer volume of evidence he amassed. What you and the Chiefio and your collaborators are doing is pure scientific gold. A trip to the tip jar is in order to help keep this going. That’s hardly a ‘good part’ of 4 degrees. If you look from the above in the Google Map view, you can note how it seems that someone has cleared the area around the instruments from the bushes which were there in the Bing view. If the 6:39 am time of posting means the temps reported were early morning readings — one can expect cool air drainage from the higher (private) station toward the lower (public) station. Just a guess as I am not near the area. The raw data and programming should be reconfigured with all airport stations removed. Period. They are an inappropriate sensor for climatology. For the US, it is way past time to start all over again. But that task does not have to be insurmountable. Parametrize the data with standardized micro-climate and climate zone identifiers. If data is missing from another sensor, fill in from some other location and then only within the same micro-climate and climate zone area (again something that can be coded in if micro-climate and climate zone data is included in standard data entry). Attention to siting detail can be automated to select an appropriate micro-climate sited sensor for fill in purposes. Plus, for quality control, every fill-in should be automatically selected (again an easy thing to code in) for site by site review before data analysis can be completed. How? Easy. If there ever was a need for grant money, this would be it. Local citizens can be called upon, just as in census workers, to be trained to collect micro-climate and climate zone data for each sensor, to go along with temperature reporting all ready being done. Then top of the line computer programmers can be trained and called upon to write a program, open for critique before being finalized, to develop a standard program for fill-in and quality control functions. Why this is not being done at the University and government program level is beyond me. It is doable. It puts to work local citizens across the country for about a year, including training and micro-climate/climate zone identifiers. If we can count every citizen, we can do temperature correctly. What is absolutely astonishing is that Mann and Hansen, working on my %$#& dime, are not leading the charge for this to happen. Too fast with the submit button. The cool air would drain from any higher slope and one such is in the photo of the airport approach. The need for a local observer is obvious. Good work, as usual, Anthony! But are the two stations at the same elevation? The private one looks like it might be up hill from the airport. A few days ago I was playing around with my infra-red thermometer in the back yard. This device will give the temperature of any surface you point it at, although it’s not extremely accurate, only +/- 3 degrees F. Anyway here are some of the readings I got. All of this really makes me wonder what we’re really getting when we measure air temperature. How much are the readings influenced by the surrounding surface conditions? The lapse rate is typically 1°F per 200′ elevation change. So expect a 0.5° cooling if you carried a handful of air from the airport to the personal station. Hardly a substantial portion of the 5° difference in question. The lapse rate of a standard atmospher is 3.57 degrees F per 1000 feet. The 130′ elevation difference between the airport and the private sensor can reasonably account for an average difference of 0.13*3.57 or 0.46F. That leaves a difference of 4.5F difference in the temps unrelated to altitude left to account for if my third grade calculus here is correct. Nice work finding the temp sensor in google street view. However 100 feet away from the tarmac isn’t far enough if there’s a light northerly breeze blowing the heated air off the tarmac right up the ying yang of the Stevenson box. According to the Weather Underground network sensor the winds that day were light & variable with, 10 minutes before the max temp recording, a 1 mph breeze from the NNW then 5 minutes of calm. If the same wind blew across the airport at that time then that’s the perfect breeze to move a mass of heated air off the tarmac into and around the Stevenson box then stall that wad of hot air on it during the calm. Keep in mind tarmac temperature easily gets 50+ degrees F hotter than the air 4 feet above it in full sun in calm air. A slight breeze comes along and starts sucking all that excess heat out of the tarmac (like an electric heater blowing air across red-hot heating elements) and mixes it up into the air near the height of a Stevenson box. When the wind is right you can view that Stevenson box 100 feet away from the tarmac as sitting in front of forced air electric heater. I agree with Stacey, that greenery is definitely a golf course. I’d be interested to see if the near contant watering that goes on there has any noticeable effect on the relative humidity in that area. I believe the general rule is that there is a decrease of 3 degrees C per 1000 ft increase in elevation. Thus, the 129 ft increase you cite is only expected to give ~0.7 F change in temperature, only a small fraction of the 4.8 F reported by Anthony. …(the difference of elevation) can explain a good part of the delta between stations temps. The difference between the stations is low and at this temperature the lapse rate would be less than a degree (F). 130ft difference with standard lapse rate of 3.5F/1000ft. Expected difference – private station should be 0.5F cooler than official site. Observed difference is 5F. Thus the difference in altitude is unlikely to be the cause. Regg, you’re not seriously stating 130 ft. elevation difference could equal 5 degrees temp difference, are you? That would be a highly suspect assertion. While I know of no formula to equate elevation to temp variance, 1 degree/26ft. seems implausible. Ian W. — is the density altitude calculation generated using the runway temperature effect value or a secondary temperature reading? I’ve been so well trained by reading Anthony’s posts that, upon seeing the highlighted location in the second image as that of the Carefree Airport, the rest of the article was somewhat anticlimactic. And so, a station swimming in a sea of hot asphalt is considered so high quality that it is used to fill in missing data for other stations — now why am I not surprised? I was surprised, however, that the official temp was only 5° higher than a non-NOAA station less than a mile away. Must have been a “cool” land breeze holding down the temp to only 109°. Too bad the reading wasn’t w/i 1200 km of Denver. Using the 1200 km radius, we could have set a new all time high temp! I’d love to see what the corresponding temperature was in the middle of that adjacent golf course that day. We’d have to come up with something like the GCCI (Golf Course Cool Island) Effect. What’s the elevation difference between the two stations?? Mods – must have forgotten to close italics in html on last post at 7:35 am – sorry! please fix or it’ll cause problems for the comments that follow. The sensor station is visible in Google street view, definitely not with the rain gauges. Is this it on Google Street view? How many of them could now be reasonably classed as urban, but in 1970 were rural and are therefore now likely to be influenced by uhi?…. I have a question on the way records are set. If a current temperature ties the old record but doesn’t exceed it, the current temperature is counted as the new record. Why is that? It’s not breaking the old record, it’s simply tying it. Shouldn’t the old record stand, or be marked with an asterisk saying “record tied July 8, 2010” or something like that? That has slight a change in elevation has a minimal effect. The difference in elevation is 129 feet. The change in temperature for one hundred feet is aprox. 0.36F by extrapolation so at best you are accounting for half a degree of the temperature change. Heh, I stand corrected. There is, indeed, a formula for degree change per change in elevation. Just one of the many reasons I frequent here. I live in Scottsdale (about 20 miles from that airport) and have been in that area recently. I can tell you that there is construction happening on that particular stretch of road and it wouldn’t surprise me a bit to learn they were laying hot asphalt on the day in question or had other heat producing equipment nearby. Work on major repairs to Cave Creek Road is finishing up. 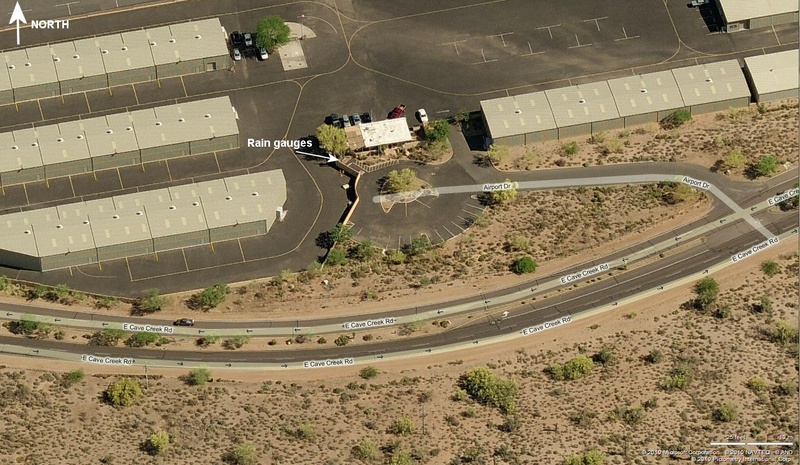 Starting Monday, July 12, workers will be striping Cave Creek Road. After the striping is complete, barricades will come down and Cave Creek Road will be open both ways to traffic. My bet would be on asphalt. Over the last say, 50 years, the number of airports has grown enormously. And old airports have undergone significant modifications to handle the ever-changing type and size of aircraft. Can anybody demonstrate what would happen to the so called ‘Global Temperature’ trend over the last 150 years if the airfield/airport records were omitted? Nice find. It looks like that weather station is in the median strip between two roads with a connector road curving around the station. As usual what is needed is someone to actually go out and look at the site and photograph it as Anthony suggested. REPLY: No that is not it. Wrong equipment, that is something else. For the US, it is way past time to start all over again. But that task does not have to be insurmountable…. Pam, this is what an “independent topics course” undergrad senior assignment is for. You get three credit hours from your topics prof to do the grunt work and write a “term paper” I did two as a senior undergraduate. One in Chemistry and one in Geology. The one I did in Geo (my partners idea and mine) was an eye opener for the Phd karst geologists. I got corralled by a bunch of them at a national convention wanting more details. The dry adiabatic lapse rate is -3°C per 1,000 feet, the standard lapse rate is -2°C per 1,000 feet, and the moist lapse rate depends on the relative humidity — it can vary from -1.1°C to -2.8°C. Normally, you’d default to using the standard lapse rate, although I wouldn’t quibble with using the dry rate in that area. >>personal station is indicating 80.3F . So what station is right ? Black body radiation? Overnight, a black surface (tarmac) will radiate more heat away and get cooler. Not sure the extent to which this will happen. Any data on this? I live in Scottsdale (about 20 miles from that airport) and have been in that area recently…. Any chance you can get Anthony his photos, or at least a verbal report on that site and the private site some time soon? gotta love this . an internet thread with a discussion of wet & dry adiabatic lapse rates . . . . never imagined that would happen when I took my climatology courses waaaaay back when. UAH and Hadley Met agree so closely on the 30 year trend is indicative that Hadley probably don’t deserve to be tarred with the same brush as the CRU crew. Having thought about this a bit more I’m not so sure. Wouldn’t we expect the troposphere to warm more than the ocean surface, given the differing heat capacities of water and atmosphere? See how much the tropospheric temp rose compared to the ssts during the 98 and 09 el ninos. Before you spend a lot of time investigating this, I have noticed exactly the same sort of issue before in practically every region of the country. I have often noticed a “record high” pop up in an area of either record low temperatures or record low high temps on this same map. Sometimes I would find a temperature that is 20 or 30 degrees warmer than any other station around it. This might be in Tennessee or Wyoming or anywhere (not just a desert area) and it can be in any area of the country. Note that I have not yet found an error in the opposite direction. I have never noticed a record low in an area surrounded by record high temperatures or record high low temps. It simply seems that anomalously high temperatures simply pop up in the data from time to time. For example, on December 5, 2009 I found a “record high temperature” in the 70’s for Samburg, TN. I looked at surrounding stations and none were over 40F that day. I then found another one in Pavillion, Wy on December 2, 2009 that claimed a temperature of 61F when I couldn’t find anything around it higher than 20F that day. So it would seem as if random “record high” temperatures simply get plugged into the data for some reason. But it is a dry heat. Can’t trust the thermometers. It is better to stick with a hunch and homogenized data. Note according to this link, the temperature for Samburg, TN is still on the books even though it is CLEARLY an error. There’s your Global Warming. Hansen and asphalt, and nothing more. a long term comparison with the weatherunderground data would be interesting to say the least. Might be interesting to approach WE about compiling downloadable history files.. I too checked and could not find that temperatures where in the 70s in the region on Dec 5. Since this occurred over the weekend, we may see noaa send out a correction for this in the next day or so as needed. Thanks for work Anthony. I don’t know where you and Steve Mc find the hours in the day. No, not even close, if the elevation difference is only 129 ft. Report back when you have looked up the correct relation between altitude and temp. It’s nice that not all new ideas or data are greeted dismissively! Maybe geologists have learned the lesson. I’ll try to make it up there. In the meantime, I’ve left a message with the Carefree construction coordinator to see if I can get any info on what might have been happening on the road in front of the airport last Thursday. Hi Bill. Thanks for the information…nice to learn some more detail on this. I remember the 3 degree number from my college geography class about 6 years ago…couldn’t remember if it was 3 F or 3 C. For the calculation, I assumed 3 C since that would cut Regg the most slack…by the time my calcs got posted, though, several others had already posted on it, some with better detail than myself. Also note that the source of these apparently random errors in NOAA record data are not apparently due to the METAR sign problem as that both the correct and incorrect data are often of the same sign in degrees C. This is just plain incorrect data, sometimes by margins much larger than 5F and often tens of degrees. But why it is always high and I have never spotted one 30 degrees low baffles me. From the looks of things, Regg found the old Stevenson box, not the current MMTS sensor. None of the Google Earth images provided so far show the familiar, white, stack o’ doughnuts shape of a MMTS sensor pod. I don’t know anything about Gail’s chemistry paper, but even if it was good, it wouldn’t surprise me at all that chemists would dismiss it immediately. I work in a graduate chemistry lab and have that happen all the time…people can’t consider anything beyond their own thoughts. As an example, the paper I’m writing now originated from an observation and subsequent idea I had 4 years ago. My advisor (a chemistry professor) said there was no way it would work. So I came in at midnight on a Saturday night/Sunday morning and did the few measurements I needed to confirm that it would at a time that I knew no one would catch me. Guess what?…it worked and turned into one of the foundations of the project I do my graduate work on. Similarly, one of the other pillars of this project was an idea I had on a highly novel and unique instrument modification that had never been considered by anyone in the field. My advisor shot it down immediately. Again, I went behind his back and developed it on my own…it revolutioned this area of measurement and we got a high-impact paper from it immediately. To summarize, my advisor shot down two ideas of mine immediately that I went on to develop without his permission, and we’ve now published multiple papers because of these ideas and my advisor has (already/to date) secured 7 figures of funding from these ideas. This is pretty standard in most areas of science from what I’ve seen. A few months ago someone suggested a nationwide data-gathering project from golf-course temperature records. These could be used, after a bit of statistical juggling, as a quick double-check for gross official errors. At a minimum. 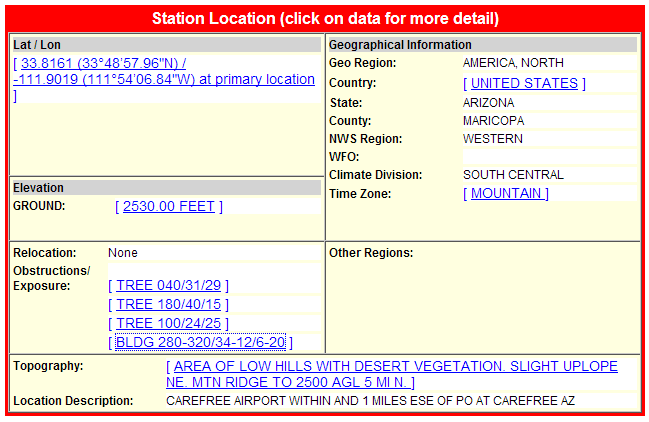 Speaking of records, this is the most “action” Carefree, Az has ever had on the WEB!! Airports need good temperature information for safety reasons. I fly a piston powered airplane, which has lower high temperature performance because the engine develops less power, the propeller bites less dense air, and the wings lift less at a given speed. Pilots use the term “density altitude” to correct for the effects of temperature. For example, here in Mojave yesterday, at a field elevation of 2800 ft, the density altitude was 6500 ft. That means you need significantly more runway. There is a U.S. Standard Atmosphere lapse rate. The standard atmosphere is supposed to be an average with regard to relative humidity, temperature, and pressure over the U.S. and is neither the dry or wet adiabatic rate but somewhere in between. From 0-11,000 feet it’s given as 3.566 degrees F per 1000 feet. Useful information for pilots. I’m surprised I couldn’t find much about temperature rises over tarmac except for one guy who embedded a thermocouple in tarmac and compared it with one 4 feet above the tarmac and found a 25 degree C temperature difference in full sun with no wind. Ground effect is something that pilots need to be aware of and is greatly increased lift at an altitude of one half of your wingspan or lower. It happens due to the air under the wing being compressed between the ground and the wing bottom. I’m not sure how much the air temperature right over the tarmac effects it. Someone with a lot more pilot experience than me might have a feel for it. I see its effect once in a while with all the great blue herons that fly about where I live. Sometimes they snag a good sized fish, maybe 1-2 pounds, and they’re able to fly with it over the water in ground effect but no higher. They have a wingspan of 6 feet or so and that equates to a ground effect altitude of 3 feet. Pretty low but high enough as it’s just high enough so they can flap without the tips of their wings dipping into the water. Some really great theater is when there’s one fish that’s too big to swallow and more than one bird on the scene. If it’s too big to swallow it’s too big to get out of ground effect with it so one of them will try to make off with it, another will dive bomb him causing him to drop the fish, a third bird might scoop it up and then one of the other actors will repeat the sequence. One morning I watched that go on for a half hour with a total of four different birds. They finally abandoned the fish and out of curiosity I went and looked at it – about a 1.5 pound blue tilapia. A few months ago someone suggested a nationwide data-gathering project from golf-course temperature records. Those generally won’t work because of the irrigation going on. The temperatures at most golf courses may not match real climate, particularly in the Western US. I would suggest adding fire watch towers to the mix. They generally have power and any air conditioning units would be well above ground level. Commercial radio transmitter antenna farm locations might also be a good choice in many locations. They have transmitter shack with power and are generally in a fenced off grassy area that isn’t irrigated. Parks are an obvious choice but may also suffer irrigation issues depending on the nature of the park. Please check your surfacestations.org info mailbox for pictures of the Carefree Airport weather station taken this morning. I am just going to contact the airport and ask. I doubt the object north of E. Cave Creek Rd. is an MMTS, but maybe they can confirm that one way or the other or even give us an exact location. Note that even if that is the station it is well within 10m. of the parking lot to the NE, which would give it a CRN4 rating. Thanks Bob — I really didn’t want to drive all the way up there! I did talk to the construction coordinator for Carefree and he is going to check with the contractor for the road project to see what was happening on that particular stretch last Thursday. Anthony, I look at that Google photo and just wish I were in a sailplane that day about 2000 feet above that asphalt parking lot! Perfect soaring weather, the hotter, the better. Some commented above about the power planes viewpoint but mine is different, I have logger many hour solo in a sailplane and when looking down on that airport from above in that Google view (guess 5000 ft), that asphalt is a perfect thermal generator. That is what we look for, dark and dry plowed fields, large asphalt expanses, etc where you always find the lift and shying from anything wet or green, that is where you always find the sink. So, on a sunny day that asphalt will always be drawing hot air from the warmest of surrounding as seen in the photo and up it goes. Also, the air within a thermal is generally about 20 degrees warmer which slows any radiation cooling from the immediate area below raising the temperature and reinforcing the thermal. We are talking micro-micro environment here, but will it affect a thermometer, better believe it. You see, temperature differences is what a sailplane pilot plays with unless getting their lift from winds against a cliff or mountains or along frontals. I know that view as in that photo well. You will never get good temperature readings in the sunny summer day placed like that. Okay, that equipment in the patch of desert between the parking lot and the road is 100% definitely not the MMTS. Looks like a rain gauge. But, yes, initial impressions were correct; the “head” of the suspected MMTS was much too large. Anthony has a — great — instinct for these things, believe it. He’s headed me off from a false spot many a time. The tower on the roof of the building shows what appears very much to be a Davis sensor. 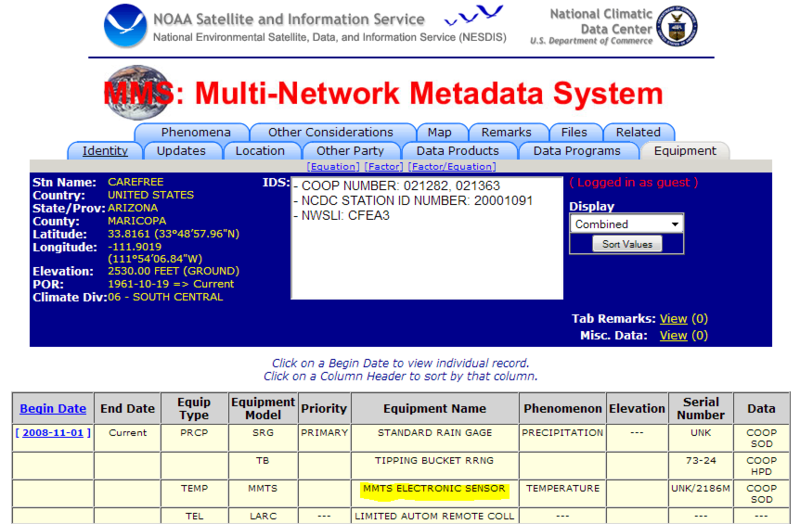 But that’s not standard NOAA equipment, and (FWIW which isn’t 100%) the NOAA site says it’s a standard MMTS. So maybe that’s it and maybe not. If that is it, it’s a CRN5; a rooftop location is a big no-no, never mind the sea of asphalt. We’ll see if the Airport gets back to me. I’ll say one more thing about soaring. I have flown out of five different airports but the very best of all was a one-mile grass runway leftover from WWII with plowed fields all around it. Perfect. In July or August, you talk about hot! It was smoking on that runway. Why, not the grass of course but the dark fields around it. The weatherman would say 104ºF for that day but by my sweat I knew it was more like 110ºF+. That is very much like these airport stations. Asphalt is even better than plowed fields, there is no moisture at the generation point at ground zero to hold the temperature down, not even one degree. Not to mention that most Airport equipment is ASOS (as opposed to CRS or MMTS) and that has all sorts of known Tmax and dewpoint problems, esp. in hot dry areas. P.S., the AP data is very useful — for planes taking off and landing at the airport: After all, the temperature at the AP over the asphalt is what a pilot needs to know. But for what’s going on climatewise, eh, not so useful. Well, you have an advantage I don’t — I still say “Siam” instead of “Thailand”…! I drove through Carefree in the first week of July in 1989, a very hot week even for Maricopa County. I remember it very well, primarily because of its most delightful name. Then it was what I would call a peri-urban area, large properties, horses in much evidence, for those who liked lots of space, the country lifestyle and could afford it. The sort of place I could have settled in given the chance. Now, when I check it on Google Earth I see golf course community developments, hangars, large houses on small plots and all of the signs of the massive urban sprawl that has taken place all over the world over the last twentyfive years. I suspect that when younger people look at temperature graphs taken over decades from a single position, they can have little idea of how the peripheries of cities generally have expanded geometrically over the years. I wonder if there are any long temperature records that can be relied on. My job in the Air Force was interpreting imagery. I did it, and did it very well, for 26 years. I took a look at the area Anthony pointed out, and think I’ve found the temperature gauge. If I have, it’s worse than we thought. The gauge is on the edge of a paved area, next to a brightly-painted and highly-reflective wall. If Anthony has a Facebook page, I can paste it there, since WordPress won’t allow pasting an image here. “This morning if i look at both station’s data. This is what would be expected with all the tarmac around the sensor. Black radiates more heat then flat land / scrub. It _will_ cool more during the night. This is not contradictory to the max observation and will go some way to reducing errors when calculating (min+max)/2. @ Anthony, excellent investigative piece. Very interesting. Thx. I have notice 2-4F added to the daily lows for my local weather station on a routine basis. I will see 48F in the morning at dawn or just after yet the next day the “official” reading for the low is 53F. I generally check the weather everyday when I get up so I have noticed this. I probably ought to start keeping a record. Gail, 2 or 3 degrees is one thing. 20 or more degrees is something entirely different. I don’t know anything about Gail’s chemistry paper, but even if it was good, it wouldn’t surprise me at all that chemists would dismiss it immediately…. My chemistry professor never even knew that project existed. I did the work between 1 am and 3 am in the morning using the lab assigned to do his project. It was actually pretty standard chemistry and physics but the geologists do not get train in it – applied solubility rates. The limestone in caves dissolves at different rates because the sand particles mask the surface. The more sand the slower the solubility rate. Real simple. Extracting the samples from the limestone and making perfect cubes was the difficult part especially with only hand tools and a permanently mounted grinding wheel available. I am sure I am not the only one dying of curiosity at this point. I know you have published “Is the US Surface Temperature Record Reliable?” which is a valuable expose on the sad state of surface temperature measurement in this country. What everyone is waiting for is “How NASA GISS Cooks The Temperature Books”, exposing how they throw away data that shows cooling tends, homogenize data, extrapolate data for a lack of northern measurement stations, etc. I suspect Regg is doubly wrong about the change in altitude of the two stations. Take a look at the approach to the runway picture. The area is very flat. I think Google maps’ elevations are probably more correct, and that they are at essentially identical altitudes. Google maps lists the gold course as Dessert Forest Golf Course. Oh, I agree however how many temperatures get jacked up 2 or 3 degrees over 365 days and what does that do to the “raw data” before they add another adjustment? Also are the other stations like this one, are they Class A COOP stations, and do they report to the climatological database? 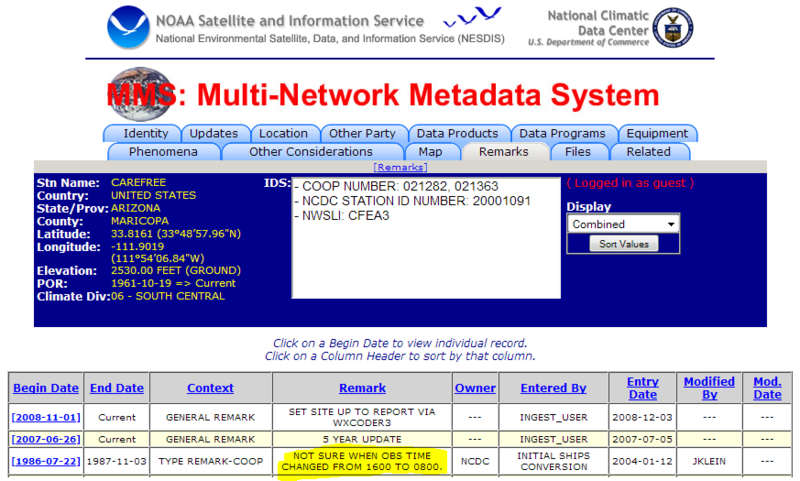 According to Anthony “This station data is used to adjust other nearby stations that have missing data in NOAA’s FILNET process, and since it is published on the Climatological CD, may also get used in climate studies of temperature.” Is that true of the other stations with false highs? It would be interesting to see how many false highs show and if they are “special stations” used to adjust other stations….. My paranoia is showing. I would have lost my hot asphalt bet! While there is road construction going on the road in front of the airport, no paving or any other major work was happening last Thursday. Well, a very easy visual check that gets the low-hanging fruit is to do just exactly as Anthony did. On that map that displays recent records, look for a record high temperature in an area surrounded by record lows (or record low high temperature) or vice versa. Just look for a report that seems opposite from all the others surrounding it. I did that for a while late last year but it seems NOAA can’t be bothered with correcting stuff like that. You won’t get them all that way but you can sure spot the very obvious errors. I mean, come on … a temperature in the 60’s when everything anywhere near it never got above freezing? The more important thing is that huge whoppers like that put a large skew in the “official” averages. Note that in your location, the “official” temperature might be recorded at a different location than is reported during the day on your local media. Government likes to locate their thermometers near a lot of asphalt, probably for easier servicing by the repair trucks should they ever begin reading too low and need repair. I have been reading your concerns about temperatures that don’t add up but are still used. Great job of investigating the record high temps crosspatch. I would not have known these facts without your investigation. Also altering lows on a daily basis is really odd. Yummy golf course. Make mine a banana split. I remember the post Katrina summer of 2006 focused on a very hot May-June Pheonix Az. Temps then soared above 105F during most days, with Jult temps averging about 110F for highs in July. When I lived in Mesa circo 1969-1970 I remember May temps near 115 deg F (via a gian Firestone temp marquee located near the freeway on the road to the airport) in early May. During that episode I remember my Dad frying an egg on the hood of our Ford station wagon in the weeks before we were let out of school. 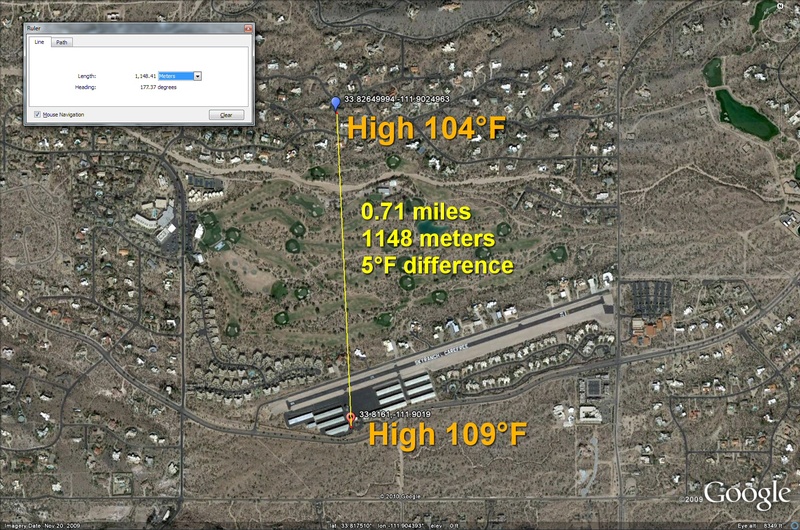 Here’s a quick lesson, after April one can expect temps in the Pheonix area to average around 110 to 120 deg F for highs. It is a desert, afterall. But don’t let the Alarmists in on what every 4th grader in Az knows. Do any of the statisticians here have the capability to determine what the chances are for record temps – record highs, record lows, record highest daily lows and record daily lowest highs – is, given that we’ve only been keeping records for 150 years in most places in the US and many for only about 100 years? Of course if we’d only been recording temps for, say, 10 years, we would have a LOT of records being set. But how often would we be seeing SOME record in SOME place in the US, given the brevity of our record keeping? Maybe. Cringe. I was so busy correcting the second “r” I tried to put in Forrest! Thanks Steve Mosher for the format of query string to get Weather Underground historic data. I’ll see if I can quickly modify the climate scraper program I wrote a few months ago to grab this data as all it does is to just create a sequence of query strings for the time period desired and outputs the returned data to a series of files. It should (I think) be fairly trivial to modify my program and I’ll post the link to download it from once I’ve got it working. (Although this statement is coming from a former programmer who had every estimate of time required to finish a program multiplied by 5 by his boss at the time). From the standpoint of producing data for use in R, is one big file of all of the readings desired or a file for every day? I recently did a small analysis of temperature data over the last 100 years for 5 urban and 5 rural sites in arizona. I would like to send it to anthony just to see what he thought. What email do i send it to? I call it AZ warming, and it looks at how the temperature adjustments for GISS data for the 10 sites actually accentuate global warming claims (erroneously IMO) over the past 30 years when accounting for urban heat effect. Thank you. But I do doubt it will be trivial. My former boss multiplied “should cost” to “will cost” by about 4. I was interested in your albedo-full sun-asphalt idea. If it was true then it sounds like something worth following up. Would your idea suggest that during the night the two records would be closer? I graphed the full days temp record for two record you talk about. The records do seem to diverge around 6am and remain apart by 2 degrees. The 4 degree difference you talk about comes from the peak in the two records coming at different times (15:00 and 16:00hrs). So far so good but the following night doesn’t come back together. A 2 degree difference remains through the night. I was wondering if you’d comment how this fits with your analysis. In fact if you could graph the full days records for comparison it might be useful. A comparison of cloudy/sunny days for the two records might be useful. Anthony – the green stuff on the right of the photo looks like a golf course to me (therefore it’s irrigation). Here in New Zealand, it is quite common for golf courses to be built next to airports (because of building restrictions). Between the airport and the private weather station there appears to be a golf course, which accounts for the green areas noted at the beginning of this post. I note that the wind at the time the private station recorded its maximum was from the SE, meaning that it was blowing towards the station from the golf course. I wonder how much irrigation that golf course has? How much cooling would the transpiration from all those greens and fairways cause? and is probably simplest to just use Notepad or a word processor to delete the lines. No, I’m not going to clean it up as that means writing code to find strings in the downloaded data rather than just streaming bytes to a file. Maybe someday when I’ve got more time. Has anyone looked in detail at Weather Underground archived data? These readings are taken every 5 minutes and are usually in peoples back yards which are far better places to measure temperatures than airport runways and would be interesting to compare “official” airport temperature records in a number of cities with the closest Weather Underground station. Conceptually a very simple project but I don’t have the time to do it. Computing an average temperature from the 288 daily readings available from the Weather Underground stations is a lot more precise than the average of min + max temperatures (and can’t believe anyone would actually use that method). @Gail I have notice 2-4F added to the daily lows for my local weather station on a routine basis. I will see 48F in the morning at dawn or just after yet the next day the “official” reading for the low is 53F. I generally check the weather everyday when I get up so I have noticed this. Yes, it would be useful to have a written record. They may have “lost” theirs. You should be careful note whether the hourly temperatures you see labeled as actual temperature readings or predicted low and high for the day and whether it is supposed to be a reading of the same apparatus as the daily log and not just a thermometer on the roof. At least one screen shot would be good to go with the records you keep. Maybe Anthony could set up a network of volenteers like the one checking station siting quality where people adopt a local station where hourly data can be seen and compare it to the daily low/high record. I’m sure that there are some people who are so intent on “saving the planet” that they see nudging up a few temperatures as a case of the end justifying the means. This way of recording temps relates to the historical use of max/min mercury thermometers. It has to be done the same way now if we are to compare to previous records. It is not supposed to accurately reflect the true mean over 24h. Download link is below the one for Canadian climate data climate scraper. It’s also in zip file format so a little easier to extract. It’s crude, but it works. Have tested it on a couple of local Weather Underground stations. Slow, but that’s just because of the amount of data; ~8.5 Mb/year. Right now can only download whole years and RSN will add ability to download smaller sections of data. Files are comma seperated values with delimiters between days. Within around 20 feet of an AC which is inside a block fence, and about 10 feet from a Coke machine. The MMTS sets on the side of the porch roof, connected by galvanized pipe fittings, and 8 feet above black asphalt parking lot. IMO depending on the wind direction and currents created by the porch roof, walls and block fencing, the instrumental data could be significantly compromised by the heat from the AC and Coke machine, not to mention the asphalt and cement patio. In any event, the location appears to break all or most siting requirements. Only incompetents would use this station for climate data. Looking at the pictures; is there any siting rule with which it complies? It is worse than useless. Well, we have lots of them. I had a pole installed in a better place for it. It’s still too close to trees, but now its closer to the house and the asphalt (bitumenous concrete) parking area, and a window air conditioner. But it’s still lots better than this site and many others producing atrocious data! Actually, it seems to do pretty well. It’s high enough so it gets lots of sun, it’s not in the stream of the air conditioner, the driveway is mainly a problem when there’s sun and a light east wind (vary rare) and the temperature sensor is about 10’/3m off the ground. So’s the anemometer, so that’s pretty bogus. Oh, lord. And this is COOP-A? When they said USHCN was the “best of the best” maybe they weren’t kidding. More’s the pity. Airports, villages & small towns need a weather station. Cities need some weather stations. Megalopolii need a bunch of weather stations. When the weather man on the evening news gives the local temp, maybe he should give the mean (after throwing the max and min readings out) and not the “Official” NOAA instrument reading. Wouldn’t hurt. Might even be ‘cooler’? I’m only now reading the post; but it comes to mind that the entire “global warming” scare is based upon the relocation of recording stations to airport environments.